?[search. This past weekend, on Valentine's day, we checked out a local furniture store on a whim. How romantic right? :) And we found the perfect one! The color of the wood blends perfectly with our roman shades and the size is perfect too. 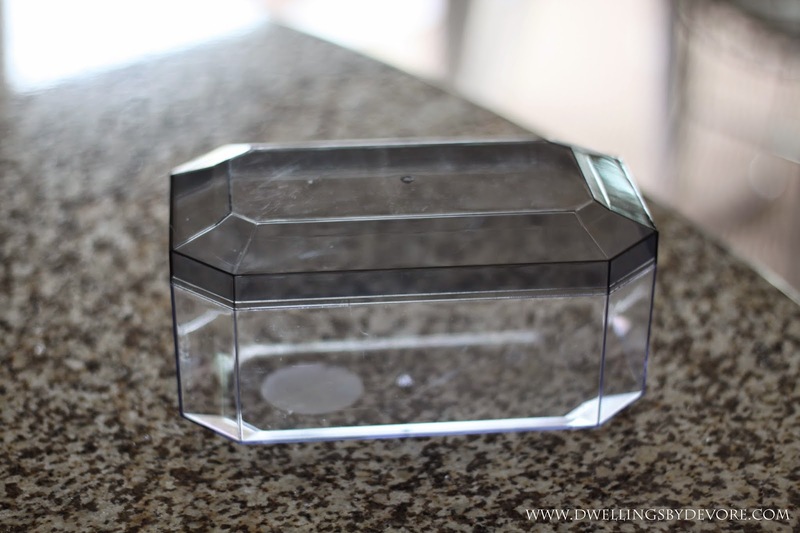 I found this faceted box in the One Spot at Target. I couldn't pass it up for $3. 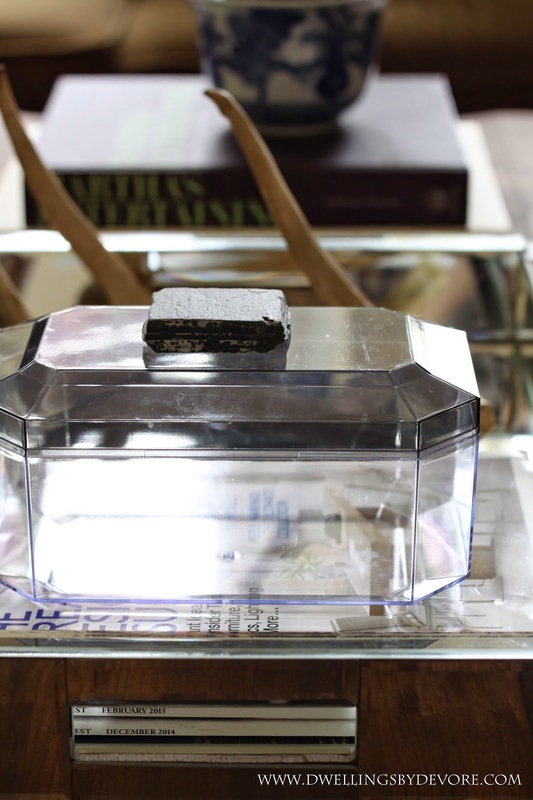 I'm always drawn to boxes for some reason and they are great for styling. I fancied it up a bit, by gluing this little rock to the top. This rock may not look like anything special, but it has a little sentimental value. When we first moved in our home, my husband found it in the backyard and he loved it because you could see the layers in it. So I held on to it as a memento of when we first moved in. I like the juxtaposition of the more modern box with the earthiness of the rock. A crystal on top would be pretty too! Slowly but surely this room is coming together! Our rug should be arriving today and I can't wait to get it down. I think it will really help pull everything together! So glad you found one! It took us forever too. I love the table and that it it has two tiers to decorate. Can't wait to see the rug! 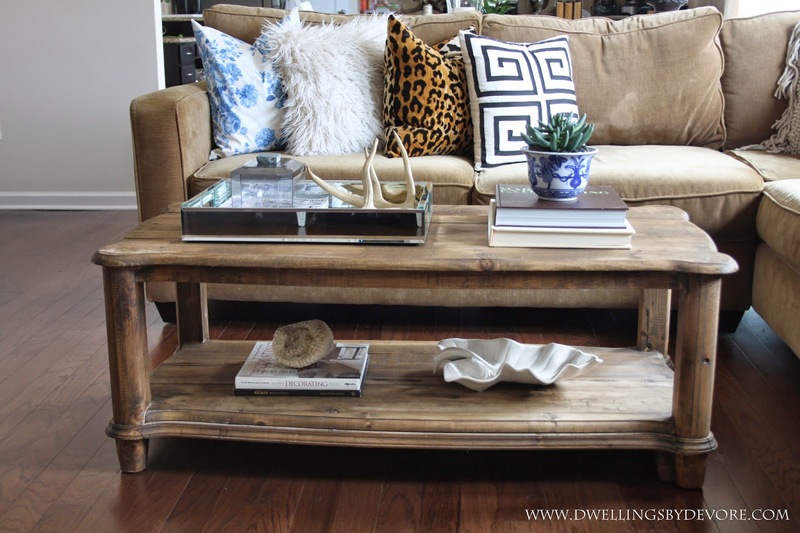 Oh I love the coffee table and so can't wait to see the rug! i LOVE the table! the room is coming together so beautifully! you are amazing. 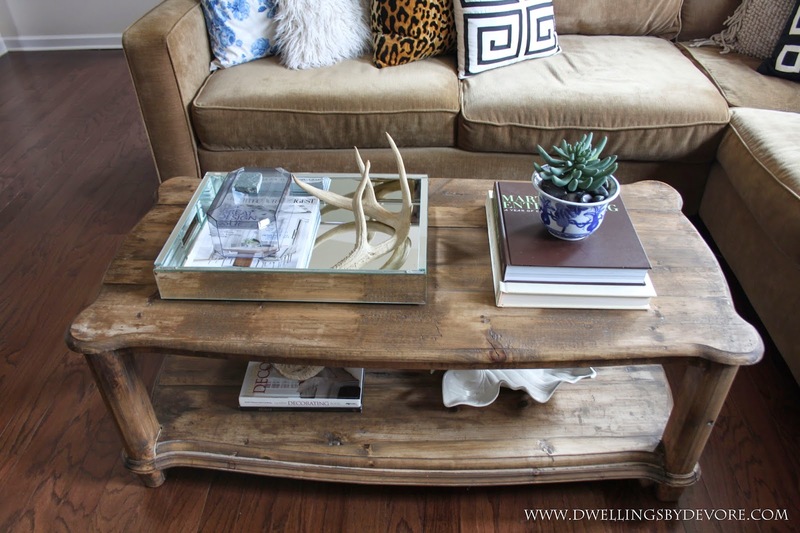 The coffee table is gorgeous, love the color of the wood Great job on the box makeover too. 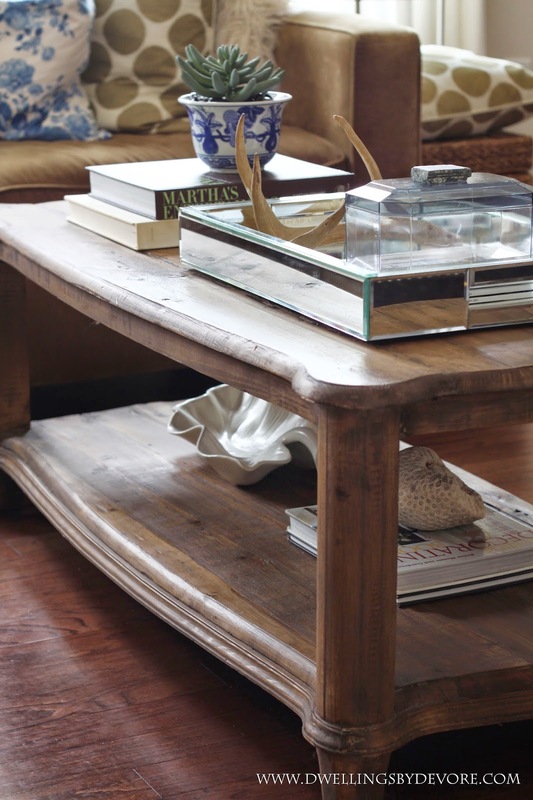 I love the coffee table! The addition of the rock to the target box makes it look high end. I may need to scoop one up if they aren't all gone. What a great table! I love the shape and the slight rustic nod. I haven't seen that box, need to keep an eye out. 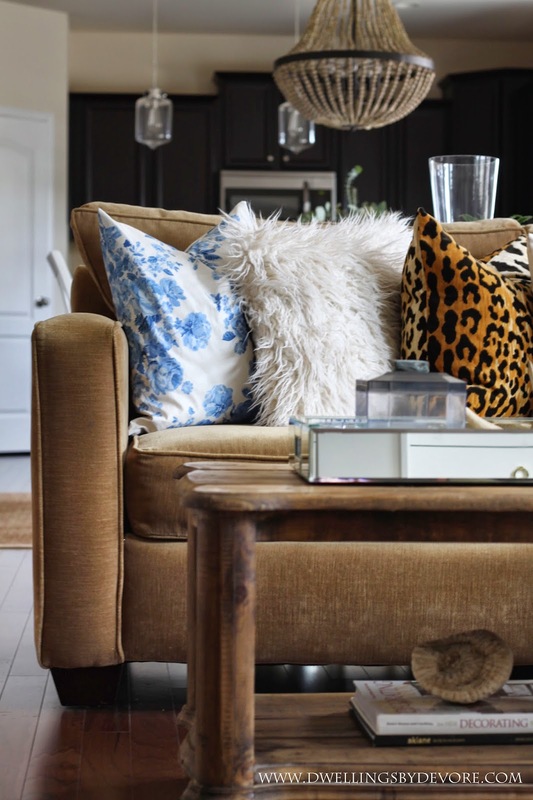 Love your little DIY, it totally brought out the chic factor! 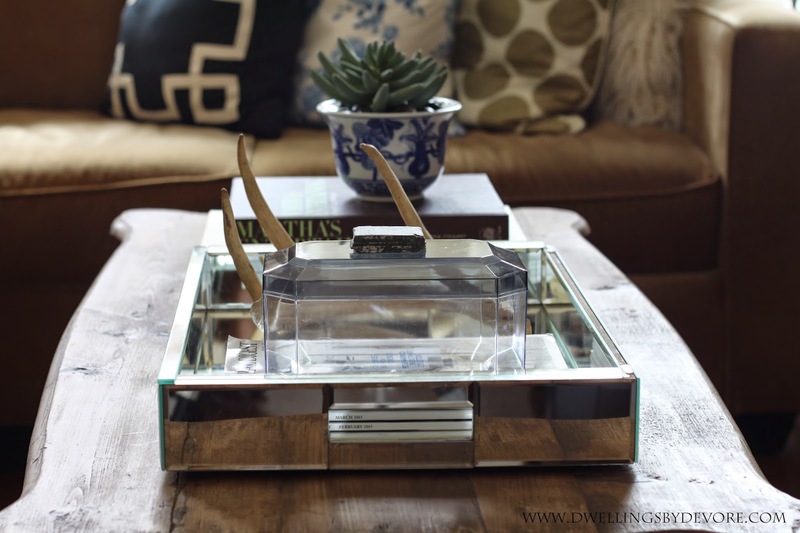 Love this table and the pretty box with the sweet rock. Such a simple but meaningful change! great table! I love how chunky it is. and your styling is spot on! Thank you so much! I love the chunkiness of it too! Thanks friend! "Slight rustic nod" is a great way to put it! I love a touch of rustic without the whole room feeling that way! Thanks so much Beth! We found it at that big furniture store across from IKEA. I have never been in there before, but they have decent prices and some cute stuff. Most of it is your typical big box furniture store stuff, but I found a few things I really liked. Thanks Marty! It was kind of hard to find that color, but I love it too! Thanks Krystine! 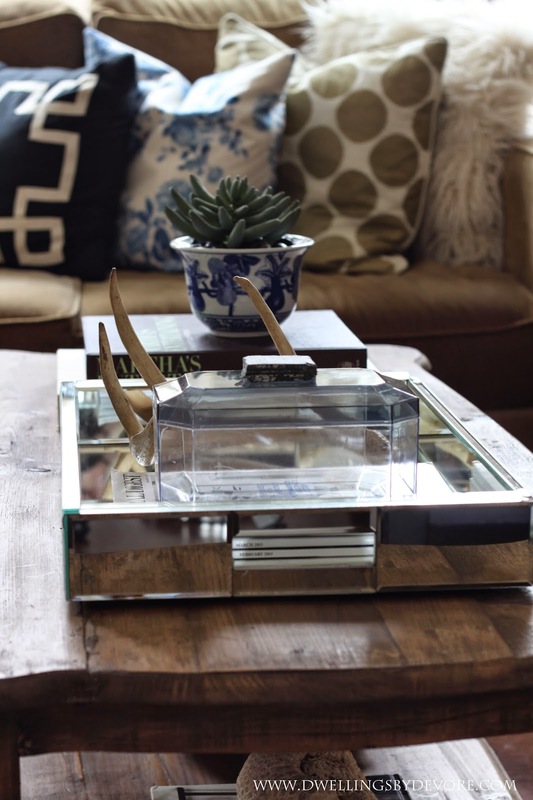 I would have never thought it would be so hard to find a coffee table, but I'm glad the search is over :) I love that it has two tiers to decorate too!